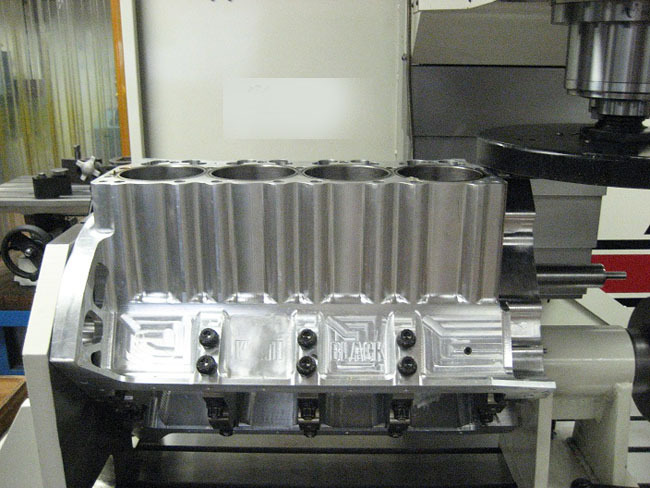 CNC Engine Block Deck Squaring and Blueprinting is an exact science referencing the crankshaft and camshaft centerline. The engine block decks must be square and true to the crankshaft and camshaft centerline. 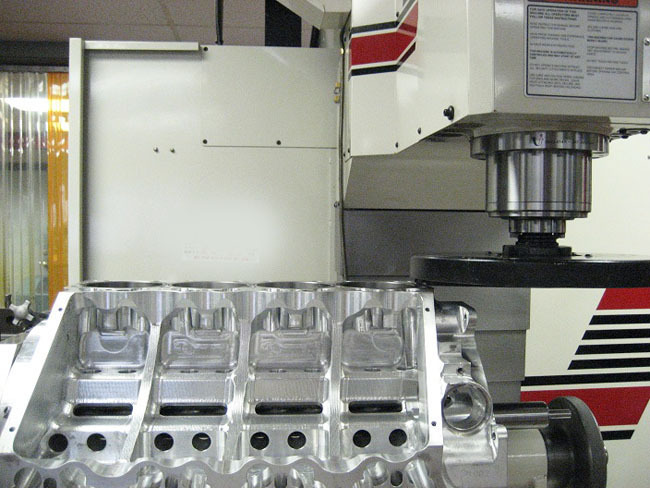 Engine block deck heights are squared and surface milled to the specific deck height. 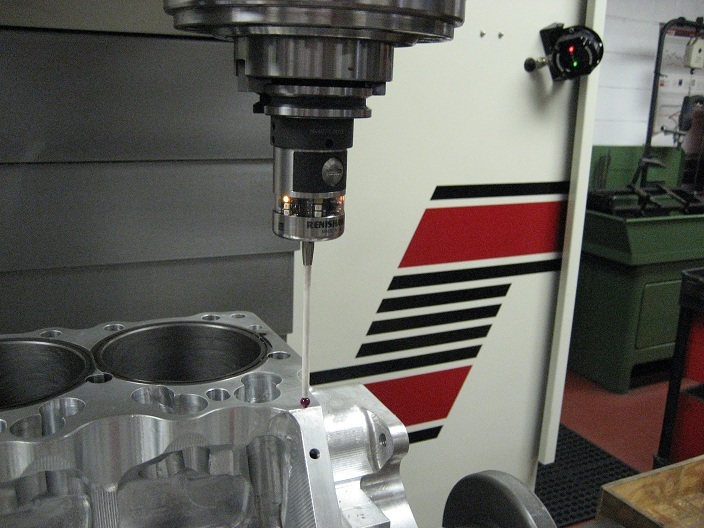 This process is achieved through the use of a datum fixture that references the crankshaft and camshaft centerline at a true 45 degrees. The CNC 4 Th Axis rotates the left and right bank to the exact angle. This enables the decks to be squared and true to the camshaft and crankshaft centerline at a true 45 degree angle. The dimensions are imputed to the CNC control holding tolerances to 0001. This accuracy is achievable with CNC machinery and specialized precision locators, tooling, CNC 4 th Axis and CNC Probing. 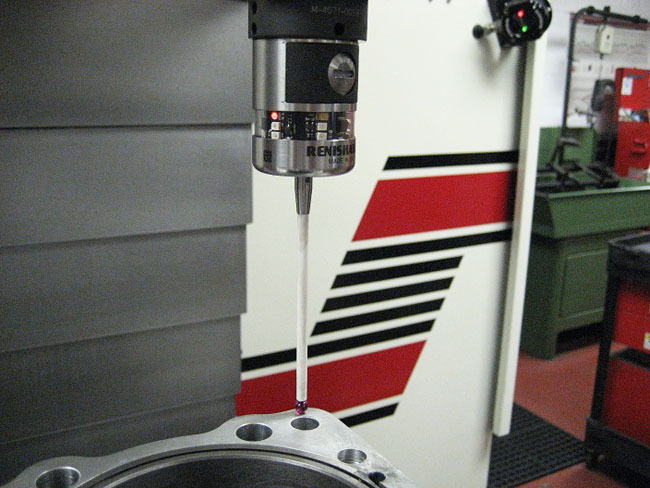 CNC engine block deck probing routine determines how much material to remove to achieve the desired deck height. Engine Block Sqaure decking left bank. CNC Engine Block Decking and Squaring. The engine block blueprinting fixture corrects improperly machined deck surfaces, commonly caused by factory machine tolerances and production line inaccuracies. This precision-machined fixture has a true 45-degree angle machined at each side of its own centerline. The Index Datum Plate, when installed on the cam-crank centerline of the block, is then referenced to roll over and correctly index the block into position for the resurfacing operation (upper photo). •Twisted Blocks: On a twisted block, it is necessary to choose a point on the deck surface to use as a reference point for set-up. As a result, you may be compounding the out-of-square condition. •Uneven Deck Clearance: Deck clearance often varies between the top and bottom edges of the piston due to the deck surface not being at 90 degrees to the bore. On race engines where deck clearances are held on the verge of piston to head contact, any discrepancy in deck angle means lost compression. •Bores Not At 90 Degrees: Since most production lines use the pan rails as the reference point, it is common to find the bores at angles other than the intended 45 degrees when referenced from the cam-crank centerline. •Cam and Ignition Timing Variations: If you have run into cam timing variations between cylinders on opposite banks, it may not be the fault of the camshaft. 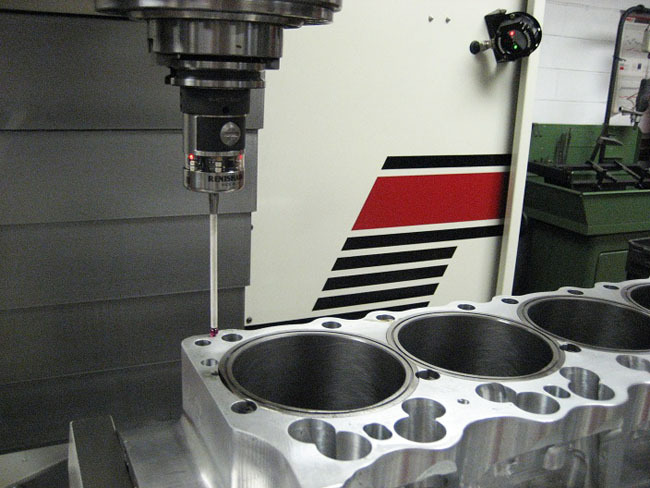 Again, since most blocks are machined from the pan rails, the cylinder "V" may not be at 45 degrees when referenced from each side of the cam-crank centerline. •O-Ring Groove Variations: If you are cutting O-Ring grooves on a boring stand which references from the pan rails, it is not uncommon to have drastic depth variations. •Poor Intake Manifold Fit: This condition is usually blamed on the intake manifold. However, if the included angle of the deck surfaces is not 90 degrees or if the top of the block has the incorrect angle, the manifold may not be at fault. •Block Deck-Height Measurements: CNC probe routine varifies all demension against blue print specs.